The Full Broncos Holiday Meal Project provides a new resource for food insecure students. Students at Boise State are rallying to help fellow students in need, making sure they have enough to eat during finals week. Food insecurity on college campuses across the country is a major issue, and Boise State is no exception to that. BSU was part of a 2017 national survey which revealed that 36 percent of students at four-year colleges experience some form of food insecurity and do not have enough to eat. Students enjoy a meal in the Boise State dining hall. 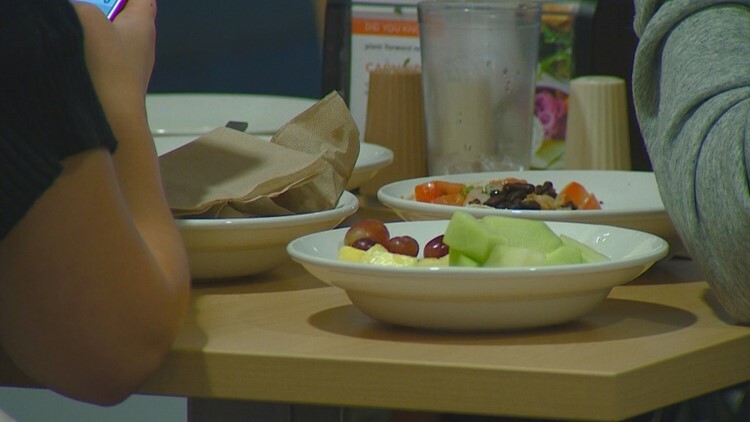 A pilot program is helping some students in need get free food during finals week. That fact led a group of BSU students to create the Full Broncos Holiday Meal Project. With the help of Boise State and Aramark, students were able to create a meal swipe donation resource at the BSU dining hall. The process is simple, to donate a meal, students tell the attendant at the entrance of the dining hall, that they would like to donate one of their guest meal swipes to the holiday meal project. Students in need simply ask attendants for a full Bronco meal, which is taken from the donation bank and given anonymously. Boise State graduate student Jessie Dexter helped put the project together, she says the goal is simple, to help students who are struggling with food insecurity. "Not only does school cost money, but it takes away time that you could be using for work so it kind of makes school more challenging and also makes those students more likely to leave the institution, and the worst case scenario is that a student drops out of school because they can't afford to eat and they leave here with no degree and student loan debt,” said Dexter. Since the Full Broncos Holiday Meal Project launched on December 5th, more than 450 meals have been donated by students; of those meals, 350 already have been applied to the Full Broncos Holiday Meal Project. Boise State also offers several other year-round support services to help students with food and housing insecurity on campus. Those include the campus food pantry program, meal assistance program and student emergency fund.